In recent years, bashing the media has become something of a competitive sport. Journalists now rank somewhere between used car salesman and trial lawyers on the scale of loathed professions. But these days there is one particular kind of journalist that is so despised, so vilified, that it has practically destroyed a once heroic and glorified career: the war correspondent. By war correspondents, I mean a generic term to describe any reporter working in conflict zones, but particularly Iraq and Afghanistan. In some circles -- notably conservative bloggers and commentators -- war correspondents are seen as the root of all evils. From terrorism to death of U.S. soldiers, the media coverage of war zones is somehow directly tied to America's problems. Just take a look at this T-shirt being sold by a conservative company called RangerUp.com. Conservative bloggers and milblogs (military bloggers) love nothing more than spreading media-bashing rumors, innuendo and flat-out lies, referring to the media as "MSM", a abbreviation for "mainstream media, but used in a derogatory manner. I'm all for freedom of speech, but some of it is downright crap. And nothing pisses me off more than the urban legend that all journalists in Iraq are hiding in the Green Zone. (The Green Zone refers to the 4-square-mile, heavily-fortified compound that is home to about 5,000 American soldiers, diplomats and civilian contractors. The Red Zone refers to any place outside the Green Zone: in other words, all of Iraq.) If you read some of these blogs, you'd think all war correspondents were sitting at the Green Zone cafe, sipping their lattes and writing our copy off CNN and wire reports. Let me make this clear once and for all: WE DO NOT LIVE IN THE GREEN ZONE! Let me repeat that, WE DO NOT LIVE IN THE FRACKING GREEN ZONE!! With the exception of TWO news agencies who shall remain anonymous, all foreign correspondents in Iraq live, work, eat and breathe in the so-called RED ZONE. Yes, we live in a secure compound, but it's patrolled by Iraqi security guards. We do NOT have U.S. soldiers, tanks, Bradleys or Apache helicopters protecting us. Neither does any other media organization. And we do not sit here by the swimming pool drinking beer all day as conservative bloggers believe. YES, WE LEAVE OUR HOTEL ROOM! Yes, we go in the street and talk to regular Iraqis and, when we're allowed, US troops. Which is more than you can say about most U.S. soldiers and U.S. Embassy employees, the majority who will never see the outside of their compound and see the REAL Iraq. Conservative bloggers say war correspondents are a buzz kill, that we are only covering "bad news" and ignoring the good news. 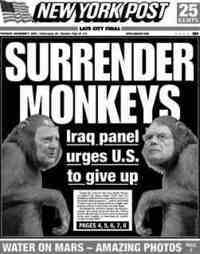 They say we are the ones leading Iraq down another Vietnam, another war we "lost" supposedly because of the media coverage of that conflict. And if things don't turn around, blogger say, the media will be responsible for the los of the Iraq war. WAKE UP, PEOPLE! Iraq is a mess. I've done my fair share of feel good stories. But there are so many stories you can cover on new school openings, water treatment plant projects and "Hurray, Iraqis have cell phones and Playstations now!" EVERY Iraqi I have spoken to say they would give up their cell phone, Internet and American electronics today if it would mean they could walk down the street without fear of being blown to bits. Most Iraqis are so frightened that they hide in their homes day and night. It's no surprise that Kofi Annan said last week that the average Iraqi had a better life under Saddam Hussein. Yes, Iraq was a dictatorship with a regime that silenced and killed critics. But the average Iraqi was not personally affected by Saddam policy. Sure they were poor, sure they had no free speech, sure they would have rather lived in the United States. But for cripes sake, THEY WERE ALIVE! They didn't have to worry about being kidnapped, tortured and killed just because of their religious sect. This is the true Iraq. The Iraq that conservative bloggers are trying to sweep under the rug. The true Iraq that war correspondents are merely documenting to the public. We journalists did not create the security situation in Iraq. We journalists are not stating pro or con agendas. We're just reporting what we're witnessing. With our own eyes. In the Red Zone. In the real Iraq.